Living Energy Farm (Louisa, Virginia) is a community of people who support themselves without the use of fossil fuel. Our project has been built at modest cost so it can be replicated around the world. Living Energy Farm is a fully operational farm and community, not just an idea. LEF empowers us to dramatically reduce our dependence on the corporate economy, and it represents a viable solution to climate change. There is a great departure between the physics of renewable energy and the politics of renewable energy. For the most part, renewable energy does not work on the individual level, nor does it work on the industrial level. Village-level use of renewable energy allows for a level of centralization and integration that makes renewable energy work fantastically well. We have cooperative housing at LEF, not free-standing, single family houses, not “tiny houses.” Cooperative use of resources is by far our most important “technology.” Shared use allows us to acquire and build and integrate much, much better housing, water, and agricultural systems, and the various tools we need to support ourselves. We build with straw bales by simply stacking them inside of a stud-frame wall. This is a fast and cheap way to build super-insulated buildings. This style of building is also well suited to large crews of unskilled workers who show up at community building parties. We can afford good insulation because we have pooled the labor and money of the people who share the use of the house. Our solar heating and cooling systems are both highly effective for us, and impractical for small houses. At LEF, our main solar rack is six 30 volt photovoltaic solar electric (PV) panels. They are stacked in series. When you stack PV panels in series, just as when you stack batteries in a flashlight, the voltage adds up. So 6 X 30 V = 180 volts. Industrial motors are easily found for 90 V and 180 V DC. High voltage allows us to use small wires, and high voltage motors are cheaper and more durable than low voltage. Storing electricity is expensive. The national electrical grid is powered mostly by massive coal plants that run all day and night. Constantly generating electrical power means they don’t have to store it. But that comes at enormous environmental costs. Off-grid houses, on the other hand, usually rely on PV and use large sets of lead-acid batteries which are toxic, explosive, and short-lived. That is a poor solution. At LEF, we do not have lead-acid batteries to support our houses or agricultural buildings. At LEF, we do not have any AC outlets or inverters because we don’t need them and because such outlets are too easily treated as free energy, and thus encourage excessive use of electronic gadgetry. A lot of off-grid designs fail when the users plug in too many gadgets. An interesting difference between AC and DC equipment is that DC equipment tolerates overloading while AC does not. Imagine you wanted to accomplish a particular task, say grinding grain for instance. If you use an AC motor, then the instant there is any weakness—if the batteries fade or the inverter gets overloaded—the system shuts down. At LEF, our main 180 volt PV rack has a nominal output of about 1.5 horsepower. But with DC motors, they tolerate a huge range of power and voltage input. We can run motors when the sky is cloudy. The motors slow down, but they keep working. We can severely overload the system, turning on numerous motors adding up to two or three horsepower. Each motor slows a bit, but they still keep doing their job. Nothing shuts down until the sun goes down. Our goal with our direct drive economy is to build machines that are cheap and effective, and to store energy in forms other than electricity. At LEF, we have slightly larger than normal water storage tanks. We have a DC well pump, not an AC pump, wired to our 180 volt PV rack. (Sun Pumps, Robison, and Grundfos are the companies with high-quality DC pumps.) Once or twice a day, we turn a small timer and charge the storage tanks. The pressure does fluctuate, and we have pay attention to what we are doing relative to the weather. That being said, we have all the water we need for domestic use and agricultural irrigation needs. There is certainly some embedded energy cost in making the equipment we use, but once installed we can use that equipment as much as we want without creating any pollution whatsoever. We have a high-output, reliable water system at about 10 percent of the cost of the “normal” off-grid model. The “integration” part comes in with all the other uses we get out of that 180 volt rack. We have homemade, cheap, solar hot air collectors on the roofs of our kitchen and the main house. (The kitchen is separate from the main house in southern dog-trot tradition, thus keeping the heat out of the house when we are cooking and canning in summer). We have 180 volt direct-drive blowers that pull heat off of these hot air collectors and pass through coarse rock under the house and the kitchen. Again, the blowers simply come on and go off with the sun. “Normal” solar heat storage has historically involved bizarrely complex systems using storage tanks, rock beds, and all manner of computerized controllers and pumps. We skip all that. The high-tech storage medium under the floor at LEF is dirt. In the summer, the irrigation water headed to the fields passes through the house first, sucking the heat out of the house on its way. Presto: free air conditioning. This, again, is something that only works on a village level. Our 180 volt solar rack also powers any mechanical devices we need. These include a grinder that grinds our grains into flour, as well as all manner of woodworking and metalworking machines. We can run any of the woodworking or metalworking equipment you would find in a woodshop or machine shop with our 180 volt DC motors. Our bottom-line fuel is firewood. We use very little firewood compared to other “homesteaders,” but we do use some. We collect dead wood, and cut it with manual cross-cut saws in the forest to get it small enough to haul home. (That’s quick and easy.) Then we have a 180 volt DC buzz saw (buck saw) that efficiently cuts the wood into stove lengths. The saw is faster, and less dangerous, than a chainsaw. And it runs on sunshine, direct-drive, no batteries, no fancy electronics. At LEF, we use 12 V DC LEDs for lighting at night. Candles and lanterns would in theory be another option, but for daily use they are neither cheap nor effective. Also, burning your house down is not particulaly sustaianable. DC LEDs are tremendously efficient. It takes two three-watt bulbs (six watts!) to light a room well enough to read the fine print in a book in the evening. The DC LEDs we use are, like the DC motors, tolerant of voltage variation. The LEDs we have are mostly rated for nine to 30 volts. A larger community would benefit from a 24 volt system for lighitng. To power our LEDs, we use nickel-iron (NiFe) batteries. NiFes have an interesting history. We have a battery from an old miner’s lamp that is decades old. It was made by Thomas Edison’s company and has his signature right on the side of it. The amazing thing about this ancient relic is that it still works! NiFe batteries last a long, long time. To our knowledge, they are the only battery technology ever developed that does not degrade with each charge cycle. That, in theory, gives them an infinite lifespan, but in practice that’s not quite true. Lead-acid batteries are delicate compared to NiFes. Lead-acid batteries are damaged by too much discharge of current. With NiFes, you can discharge them all you want and not hurt them. NiFes were in heavy use in industry 50 years ago. If they are so good, why are they not used more? There are a couple of answers to that question. NiFes are large, heavy, and expensive relative to their power output. They are the opposite of a cell phone battery in every way. The modern power-hungry world has opted for short-lived, high-output, compact batteries instead. In moving toward taking the LEF model to villages around the world, we realized that people living in non-industrial societies are often reliant on cell phones. If we in Virginia separate ourselves from commercial media, it is no big deal as we have numerous other means of access to information and resources. We cannot demand the same of villagers around the world. To test our low-voltage NiFe system, we have tied an automotive cell phone charger (as would plug into a cigarette lighter in a car) into out 12 V NiFe lighting system. We have found that we can charge as many cell phones and personal devices as we want, for ourselves, interns, and visitors, and the system has held up well. Charging directly from DC to DC (without going through an inverter) is much more efficient. We earn our living growing open-pollinated seeds that we sell in bulk to seed companies. To plow our fields, we use a woodgas tractor. Woodgas was the technology that kept Europe from starving during World War II. When Europe was cut off from fossil fuel in the war, much of the agricultural equipment was switched to woodgas. It is a complex and fussy process compared to other biofuels, but the feedstock (woodchips) does not compete with poor people’s food as is the case of biodiesel and ethanol. Woodgas is made easier by the fact that thousands of people are using it, there are email lists for information, and several companies are making equipment. Our bylaws say that we use woodgas on the farm only. There is no biofuel that can power the American fleet of cars sustainably, and anyone who tells you otherwise is lying. We have had draft animals on the property, and may again in order to assess their sustainability. Draft animals are much better from a self-sufficiency standpoint, as they can eat grass and regenerate themselves. But from a global sustainability standpoint, small tractors (in addition to hand work) are probably more sustainable than draft animals. Humans and our domestic animals now comprise a stunning 96 percent of the terrestrial zoomass (total weight of animals) on the planet Earth. Of everything we do, keeping so many ruminants makes them the largest single contributor to both species extinction and greenhouse gases. Draft animals are often integrated into the food production system of traditional farms. We favor a diet that contains as much home-grown food as possible. Given the financial and environmental costs of animal-based foods, both on our farm and the world at large, our diet is primarily focused around plant foods. Even though draft animals are clearly much less industrial than a small tractor, the tractor is probably more sustainable in a world of 7.5 billion people. Finding sustainable and pleasant ways to cook food has been our biggest challenge. 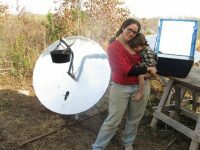 Currently we use both solar ovens and solar parabolic cookers. The parabolic cookers are less well-known, but more effective. They cook better in sub-optimal conditions. Numerous companies make models for sale, and they are not hard to build. 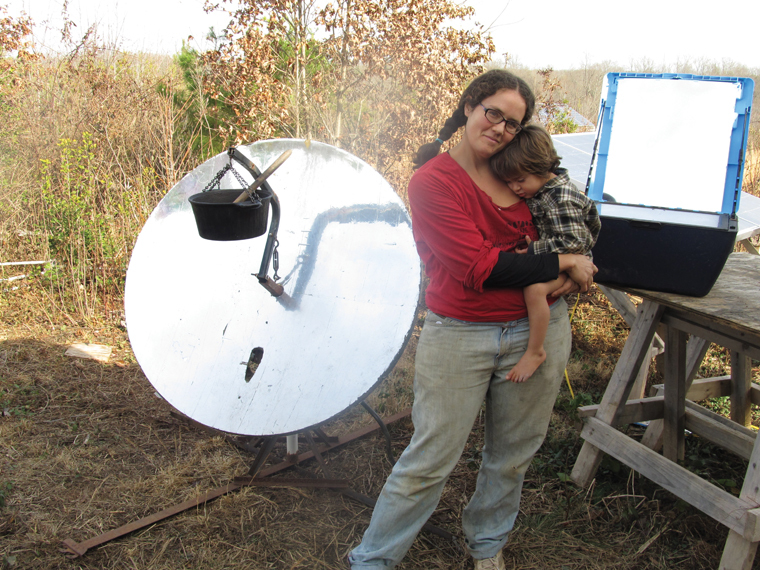 Solar ovens can be purchased or homemade, but they need to be well designed to work well. We grow a lot of our own food. Some of our seed crops (like peppers) supply both food and seeds at the same time. We grow a lot of vegetables, and we are expanding our production of staple foods. We also grow naturally disease-resistant fruit and nut trees. Trees are one of the most resilient forms of agriculture because they have such enormous root systems. Tree foods also represent a zero soil erosion form of agriculture. We have done a lot of work to figure out which tree foods work well. Growing all that food means we need to preserve some of it. The solar heating system for the kitchen doubles as industrial-scale food dryer (more systems integration that is only possible in a village). We simply divert the air that would normally be forced under the floor through a closet around the blower. The air is heated with sunshine and blown about with 180 V DC power. We can stack many layers of food-drying screens in the closet around the blower. We can dry large volumes of food quickly and efficiently, and with zero emissions. We have been led to believe that living sustainably or reducing our “carbon footprint” is difficult, expensive, reliant on new technologies, and involves personal discomfort. None of that is true. Living a comfortable and happy life supported by renewable energy is easy if we are willing to adjust our lifestyles to the rhythms of nature. That’s not what we are doing currently. The reality is that most of the people in the world today live a low-impact lifestyle because they cannot afford otherwise. Poorer people all over the world share resources and support each other. But consumption is power, and in order to hold onto that power, we hide behind grid-tied solar electricity, windmills, grass-fed beef, and a host of other layers of pale green paint slathered over consumer society. Real sustainability means that we have to share resources and live with some degree of modesty. And we have to call the Earth sacred. It is clear that mountains of facts will not convince us to change. We are destroying the sacred living Earth even as we sit and jabber about the ecological holocaust. The answers are not difficult. It is time we embrace them. Born on a largely self-sufficient farm in rural Georgia, Alexis Zeigler is a self-taught activist, builder, mechanic, writer, and orchardist. He has organized numerous successful campaigns focusing on political, environmental, and economic localization issues. He is currently helping to build Living Energy Farm (livingenergyfarm.org), a zero-fossil-fuel farm aiming to be economically self-sufficient. He released the book Integrated Activism (North Atlantic Books) in 2013. ← Are you part of an impact center?